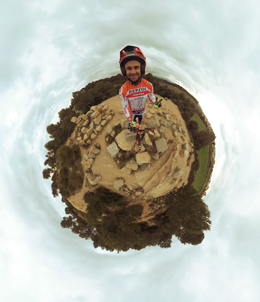 Toni Bou, the Spanish trial pilot 25 times world champion, is ready to show us his most incredible skills on his new 360 and VR channel. In The Dream VR you’ll be able to feel the adrenalin of this sport and you’ll get immersed in Toni Bou’s fascinating world. Toni Bou 360º will be a channel full of challenges, astonishing skills and experiences that will bring you to the real trial environment. Imagine how could it be in 360 and VR and be the first one to discover it! Toni Bou fans will be able to enjoy exclusive 360º and VR content on the official Toni Bou 360º channel on The Dream VR app on mobile, TV and VR headsets. All Toni Bou fans who subscribe to Toni Bou 360º channel can enjoy an immersive experience and ongoing contents of intimate moments with their favourite motorcycle star and get access to exclusive products and special offers exclusively designed for Dreamers.